Extra heavy duty construction gives these cabinets excellent security and extended service life. All welded cabinet construction utilizes 14 gauge steel to provide a 1450 lb. capacity per shelf. Includes 4 shelves that bolt securely into keyhole slots and adjust at 3" increments on channels that also reinforced cabinet vertically. Shelves are 14 gauge steel with flanged edges for added rigidity. 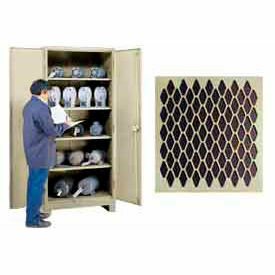 Storage cabinet doors are made from super strong diamond perforated steel to permit visibility and ventilation. Doors close with a 3 point locking mechanism made with 3/8" thick round locking bars. Door handle is rugged, diecast steel with a 3/8" thick padlock hasp. Each door has 3 heavy duty welded hinges with 5/16" diameter brass hinge pins to keep contents secure. Height includes 4"H legs (7 gauge steel) that make cabinets forkliftable. Storage cabinets are shipped assembled and ready to use. Baked enamel finish. Lifetime Limited Warranty.